EDIT: Just realized that when I made this video I had the testing mode enabled. If you see something funny, that's because it's testing. For those who are more technically inclined, this is operating in 8bpp mode, and is using the extra vRAM as a back buffer, and then copying the entire screen every frame. For timing, it uses the RTC in order to keep my life sane. Not too bad on speed with a ez80. Nicely done sir, this is crazy good and looks very close to the original. This is incredibly good work, Mateo; congratulations for getting it this far, and thank you for sharing it with us. I did indeed notice a few bits of gameplay weirdness in there, so I'm glad you added that disclaimer. Did you find yourself using a fair number of ez80-specific features in this, or was your code largely z80 opcodes? Is it written mostly in ADL or non-ADL mode? How difficult did you find it was to adapt your common coding patterns to awareness of 24-bit registers? I find that I tend to use the z80 opcodes a bit more than I would like; but there are some such as mlt that I find very useful. It is almost all ADL mode; which I will probably change to save some space, and adapting to 24-bit was relatively not too bad at all. There's not too much that makes this much different than programming on the CSE or other calculators other than the hardware available. Will you be porting snake before long? Woah that looks great! It looks very close to the NES version and original. 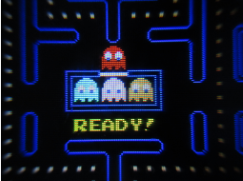 By the way, have you ever tried AssemblyBandit's CSE Pacman clone? His version was 160x120. 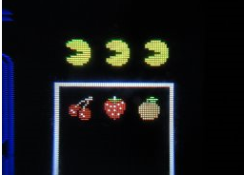 Update: Added in a clock, made ghosts slower in tunnels, and added high scoring system, along with numbers that appear when you eat a ghost or fruit. Fantastic work man! Looks great and runs well too . This looks amazing, Mateo! Is this the first more or less complete assembly game for the CE? And out before the Wacky Fun Random Numbar Generator, too? Great work! Yes; it's almost done; I still need to add in the home screen and help screen. Also, the map can easily be changed depending on the tiles in the map, so I may at some point make it possible to do custom maps, or other maps within the game. It's really just a demo program; but is completely playable, and functions much like the original. I'm going to include the source as well, which is somewhat of a mess because I wrote it kind of fast. But hopefully it gives an idea of how to do things, and makes it easier to begin other projects. Actually; I did. Most things are exactly the same, including the targeting system, and the speed differences, including the scoring system. There are a few differences; the targeting system for Inky is a little different; and there are only 242 dots; not 244; but 20 points is added to your score after every level to account for this. But other than that; not too many things are different. Well, this little guy has been uploaded! Enjoy; and please post any questions you may have! I can't wait to try it. Come on CE, hurry up and get here! Wow, that makes me wish that French sites would finally have the TI-83 Premium CE in stock so I could get one and try this. This looks really good and smooth. You should upload it on ticalc.org as well. That would definitively be news-worthy material there (if ticalc still does news, that is, since it appears not). *bump* I just want to say that I've had my ear to the ground, and I've heard that people are very impressed with your work on this, Mateo. Congratulations on work sufficiently cool to impress even non-gamers. Hm, neat. Makes me want to work on TextViewerCE a little more. Maybe add in some editing features and things. Could be a thing when I get some higher priority things done. Good idea! With custom colors maybe? Members: beckadamtheinventor, cwt1078, GregsAStar, ProgrammerNerd, realdonutking123, rfdave, SomeCoolGuy, Unicorn, _iPhoenix_. © Copyright 2000-2019 Cemetech & Christopher Mitchell :: Page Execution Time: 0.094478 seconds.